cally to enhance the characteristics we love in coastal malts. These whiskies were first aged in American Oak barrels prior to their initial blending, and were then matured for a second period in our specially coopered custom-made Mossburn Casks. With each of the malts having its very own: Cask Bill #1 for the Island and Cask Bill #2 for the Speyside. 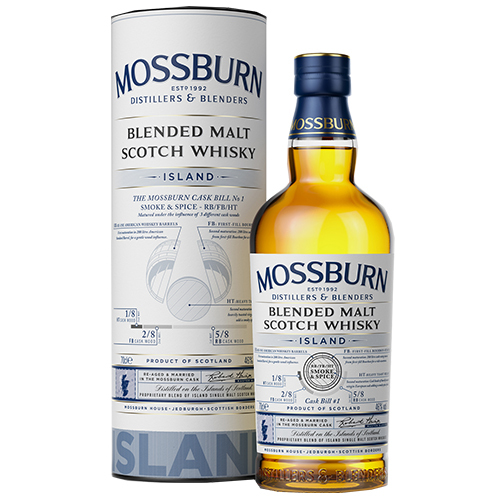 Mossburn Blended Malt Scotch Whiskies have been bottled without any colouring or chill filtration. No doubting the signature Island smoke and spice immediately apparent on the nose, but this is more a seductive clove and pot-pourri spice rather than medicinal coastal woodsmoke. The oak influence is more visible in the flavour with a touch of tannin and spice on the initial taste which mellows with heathery dried fruit and more pepper coming through later. The finish is long with a little dry fiery kick at the close.